Description: The Extrapolar SWIFT model is a fast ozone chemistry scheme for interactive calculation of the extrapolar stratospheric ozone layer in coupled general circulation models (GCMs). In contrast to the widely used prescribed ozone, the SWIFT ozone layer interacts with the model dynamics and can respond to atmospheric variability or climatological trends. The Extrapolar SWIFT model employs a repro-modelling approach, where algebraic functions are used to approximate the numerical output of a full stratospheric chemistry and transport model (ATLAS). The full model solves a coupled chemical differential equations system with 55 initial and boundary conditions (mixing ratio of various chemical species and atmospheric parameters). Hence the rate of change of ozone over 24 h is a function of 55 variables. Using covariances between these variables, we can find linear combinations in order to reduce the parameter space to the following nine basic variables: latitude, pressure altitude, temperature, local ozone column, mixing ratio of ozone and of the ozone depleting families (Cly, Bry, NOy and HOy). We will show that these 9 variables are sufficient to characterize the rate of change of ozone. An automated procedure fits a polynomial function of fourth degree to the rate of change of ozone obtained from several simulations with the ATLAS model. One polynomial function is determined per month which yields the rate of change of ozone over 24 h. A key aspect for the robustness of the Extrapolar SWIFT model is to include a wide range of stratospheric variability in the numerical output of the ATLAS model, also covering atmospheric states that will occur in a future climate (e.g. temperature and meridional circulation changes or reduction of stratospheric chlorine loading). For validation purposes, the Extrapolar SWIFT model has been integrated into the ATLAS model replacing the full stratospheric chemistry scheme. Simulations with SWIFT in ATLAS have proven that the systematic error is small and does not accumulate during the course of a simulation. In the context of a 10 year simulation, the ozone layer, simulated by SWIFT, shows a stable annual cycle, with inter-annual variations comparable to the ATLAS model. The application of Extrapolar SWIFT requires the evaluation of polynomial functions with 30–100 terms. Nowadays, computers can calculate such polynomial functions at thousands of model grid points in seconds. SWIFT provides the desired numerical efficiency and computes the ozone layer 104 times faster than the chemistry scheme in the ATLAS CTM. Yasunaka, S. ; Siswanto, E. ; Olsen, A. ; [et al.] Hoppema, Mario ; Watanabe, E. ; Fransson, A. ; Chierici, M. ; Murata, A. ; Lauvset, S.K. ; Wanninkhof, R. ; Takahashi, T. ; Kosugi, N. ; Omar, A.M. ; van Heuven, S. ; Mathis, J.T. Description: The denudation history of active orogens is often interpreted in the context of modern climate gradients. Here we address the validity of this approach and ask what are the spatial and temporal variations in palaeoclimate for a latitudinally diverse range of active orogens? We do this using high-resolution (T159, ca. 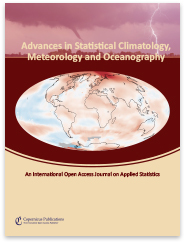 80 × 80 km at the Equator) palaeoclimate simulations from the ECHAM5 global atmospheric general circulation model and a statistical cluster analysis of climate over different orogens (Andes, Himalayas, SE Alaska, Pacific NW USA). Time periods and boundary conditions considered include the Pliocene (PLIO, ∼3Ma), the Last Glacial Maximum (LGM, ∼21ka), mid-Holocene (MH, ∼6ka), and pre-industrial (PI, reference year 1850). The regional simulated climates of each orogen are described by means of cluster analyses based on the variability in precipitation, 2 m air temperature, the intra-annual amplitude of these values, and monsoonal wind speeds where appropriate. Results indicate the largest differences in the PI climate existed for the LGM and PLIO climates in the form of widespread cooling and reduced precipitation in the LGM and warming and enhanced precipitation during the PLIO. The LGM climate shows the largest deviation in annual precipitation from the PI climate and shows enhanced precipitation in the temperate Andes and coastal regions for both SE Alaska and the US Pacific Northwest. Furthermore, LGM precipitation is reduced in the western Himalayas and enhanced in the eastern Himalayas, resulting in a shift of the wettest regional climates eastward along the orogen. The cluster-analysis results also suggest more climatic variability across latitudes east of the Andes in the PLIO climate than in other time slice experiments conducted here. Taken together, these results highlight significant changes in late Cenozoic regional climatology over the last ∼3Myr. 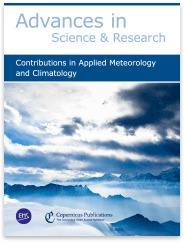 Comparison of simulated climate with proxy-based reconstructions for the MH and LGM reveal satisfactory to good performance of the model in reproducing precipitation changes, although in some cases discrepancies between neighbouring proxy observations highlight contradictions between proxy observations themselves. Finally, we document regions where the largest magnitudes of late Cenozoic changes in precipitation and temperature occur and offer the highest potential for future observational studies that quantify the impact of climate change on denudation and weathering rates. 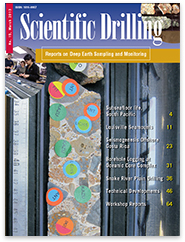 In: Scientific Drilling, 5 . pp. 63-66. Description: In March 2007 the sea floor drill rig MeBo (short for “Meeresboden-Bohrgerät”, ‘sea floor drill rig’ in German) returned from a 17-day scientific cruise with the new German research vessel Maria S. Merian. Four sites between 350 m and 1700 m water depth were sampled at the continental slope off Morocco by push coring and rotary drilling. 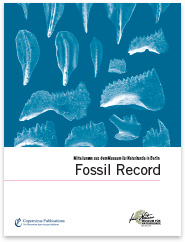 Up to 41.5-m-long sediment cores were recovered from Miocene, Pliocene, and Pleistocene marls. MeBo bridges the gap between conventional sampling methods from standard multipurpose research vessels (gravity corer, piston corer, dredges) and drill ships. Most bigger research vessels will be able to support deployment of the MeBo. Since the drill system can be easily transported within 20-ft containers, worldwide operation from vessels of opportunity is possible. With the MeBo a new system is available for marine geosciences that allows the recovery of high quality samples from soft sediments and hard rock from the deep sea without relying on the services of expensive drilling vessels. In: Scientific Drilling, 22 . pp. 49-61. Description: The Argentine margin contains important sedimentological, paleontological and chemical records of regional and local tectonic evolution, sea level, climate evolution and ocean circulation since the opening of the South Atlantic in the Late Jurassic–Early Cretaceous as well as the present-day results of post-depositional chemical and biological alteration. Despite its important location, which underlies the exchange of southern- and northern-sourced water masses, the Argentine margin has not been investigated in detail using scientific drilling techniques, perhaps because the margin has the reputation of being erosional. However, a number of papers published since 2009 have reported new high-resolution and/or multichannel seismic surveys, often combined with multi-beam bathymetric data, which show the common occurrence of layered sediments and prominent sediment drifts on the Argentine and adjacent Uruguayan margins. There has also been significant progress in studying the climatic records in surficial and near-surface sediments recovered in sediment cores from the Argentine margin. Encouraged by these recent results, our 3.5-day IODP (International Ocean Discovery Program) workshop in Buenos Aires (8–11 September 2015) focused on opportunities for scientific drilling on the Atlantic margin of Argentina, which lies beneath a key portion of the global ocean conveyor belt of thermohaline circulation. Significant opportunities exist to study the tectonic evolution, paleoceanography and stratigraphy, sedimentology, and biosphere and geochemistry of this margin. In: [Talk] In: EGU General Assembly 2010, 02.05.-07.05.2010, Vienna, Austria . Geophysical Research Abstracts . Description: EGU2010-13373 The frequency of volcanic activity varies on a wide rangeof spatial and temporal scales, from <1 yr. periodicities in single volcanic systems to periodicities of 106 yrs. in global volcanism. The causes of these periodicities are poorly understood although the long-term global variations are likely linked to plate-tectonic processes. Here we present evidence for temporal changes in eruption frequencies at an intermediate time scale (104 yrs.) using the Pleistocene to recent records of widespread tephras of sub-Plinian to Plinian, and occasionally co-ignimbrite origin, along the Pacific Ring of Fire, which accounts for about half of the global length of 44,000 km of active subduction. Eruptions at arc volcanoes tend to be highly explosive and the well-preserved tephra records from the ocean floor can be assumed to be representative of how eruption frequencies varied with time. Volcanic activity along the Pacific Ring of Fire evolved through alternating phases of high and low frequency; although there is modulation by local and regional geologic conditions, these variations have a statistically significant periodicity of 43 ka that overlaps with the temporal variation in the obliquity of the Earth’s rotation axis, an orbital parameter that also exerts a strong control on global climate changes. This may suggest that the frequency of volcanic activity is controlled by effects of global climate changes. However, the strongest physical effects of climate change occur at 100 ka periods which are not seen in the volcanic record. We therefore propose that the frequency of volcanic activity is directly influenced by minute changes in the tidal forces induced by the varying obliquity resulting in long-period gravitational disturbances acting on the upper mantle. In: [Poster] In: EGU General Assembly 2010, 02.05.-07.05.2010, Vienna, Austria . 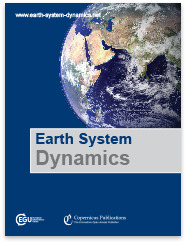 Geophysical Research Abstracts ; /EGU2010-12153 . Description: We present Mg/Ca analyses performed via a Flow Through sequential dissolution device connected to an ICP-OES on the planktonic foraminifer Globorotalia inflata. 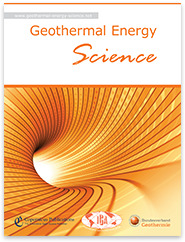 The aim of the study is to explore the possibility to reconstruct the thermal gradient in the water column by separating non-crusted and crusted calcite phases in the tests of G. inflata using the difference between their Mg/Ca ratios as a measure of the thermal gradient. An important assumption is that the non-crusted part of the tests is calcified in shallow, warmer water than the crusted part. For analyses a range of different preparation steps were used to determine the ideal way of separating the phases. Foraminifer tests were (not) cleaned, (not) crushed, and (not) pulverized before online analysis with the FT device. To analyze samples with a FT device the foraminifer tests are placed on a filter with a mesh of 0.45 μm preventing clay minerals to wash through. A sequential dissolution protocol first rinses the samples with buffered Seralpur water before QD HNO3 is added in small steps to create a ramp of increasing acid strength. As acid is kept constant at each concentration for several minutes, dissolution of a specific calcite phase can take place. Initial results show that it is most effective to slightly crush the tests without applying standard cleaning procedures, but rather analyze them without cleaning. Samples were selected from the South Atlantic (core tops and specific downcore samples) and the Mediteterranean (plankton tows). All samples were chosen based on previous work on them to provide comparison with routinely analysed Mg/Ca ratios. The South Atlantic samples have been analyzed extensively as bulk samples separated in difference size fractions and crusted vs. non-crusted (Groeneveld and Chiessi). The Mediterranean samples were not only analyzed as bulk samples but also by Laser Ablation ICP-MS (von Raden et al.). Results show that bulk analyses are reliably reproduced by the FT method, especially for samples which are dominated by crusted calcite. Samples which were uncrusted often gave much higher Mg/Ca ratios than the bulk analyses. These higher Mg/Ca ratios mainly occur in the plankton tow samples and were also identified with Laser Ablation ICP-MS. A possible reason for this could be the presence of a high Mg amorphous calcite layer on the outside of foraminifer tests which have not completed their calcification yet as was recently also pointed out in several other studies. Identification of the crusted and uncrusted phases, and therewith a thermal gradient, seems to give the expected differences but a more rigorous statistical treatment is needed to pinpoint singular dissolution phases. Dannowski, Anke ; Grevemeyer, Ingo ; Ranero, Cesar R.
In: [Poster] In: EGU General Assembly 2011, 03.04.-08.04.2011, Vienna, Austria . 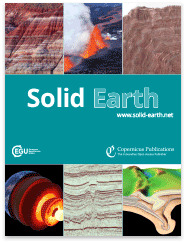 Description: EGU2011-13199 Images of crustal construction provide a key to understand the interplay of magmatism and tectonism while oceanic crust is build up. Bathymetric data show that the crustal construction is highly variable. Areas that are dominated by magmatic processes are adjacent to areas that are highly tectonised and where mantle rocks were found. The Mid-Atlantic Ridge at 22°N shows this high variability along the ridge axis, within the TAMMAR segment, and from segment to segment. However, this strong variability occurs also off-axis, spreading parallel, representing different times in the same area of the ridge. A fracture zone, with limited magma supply, has been replaced by a segment centre with a high magmatic budget. Roughly 4.5 million years ago, the growing magmatic active TAMMAR segment, propagated into the fracture zone, started the migration of the ridge offset to the south, and stopped the formation of core complexes. We present data from seismic refraction and wide-angle reflection profiles that surveyed the crustal structure across the ridge crest of the TAMMAR segment. These yield the crustal structure at the segment centre as a function of melt supply. The results suggest that crust is ~8 km thick near the ridge and decreases in thickness with offset to the ridge axis. Seismic layer 3 shows profound changes in thickness and becomes rapidly one kilometre thicker approx. 5 million years ago. This correlates with gravimetric data and the observed “Bull’s eye” anomaly in that region. Our observations support a temporal change from thick lithosphere with oceanic core complex formation to thin lithosphere with focussed mantle upwelling and segment growing. The formation of ‘thick-crust’ volcanic centre seems to have coincided with the onset of propagation 4.5 million years ago. Description: Earthquake history shows that the Sunda subduction zone of the Indonesian margin produces great earthquakes offshore Sumatra, whereas earthquakes of comparable magnitude are lacking offshore Java and the Lesser Sunda islands. Morphological structures from multibeam bathymetric data across the forearc relate with the extent of the seismogenic zone (SZ). Off Java and the Lesser Sunda islands the Indo-Australian plate subducts almost normal underneath the oceanic plate of the Indonesian archipelago. Landward of the trench, the outer wedge of the slope break is ~50 km uniformly wide with uniform bathymetric gradients. The slope of the outer wedge is locally cut by one/two steeper ridges of ~5 km extent. The sharp slope break corresponds to the updip limit of the SZ, which is also associated with the seawardmost part of the outer arc high. Landward of the slope break we find narrow, uniform outer arc ridges. The landward termination of these ridges coincides with the downdip limit of the SZ. The intersection of the shallow upper plate mantle with the subduction thrust fault marks the downdip limit of the SZ beneath the forearc. Off Sumatra the Indo-Australian plate subducts obliquely underneath the continental part of the Indonesian Sunda margin. Landward of the trench, the outer wedge varies, being mostly ~70 km wide, in some areas narrowing to 50 km width. The lower slope bathymetric gradients are steep. The outer wedge slope is made up of several steeper ridges of ~5 km extent. The slope break is only locally sharp, and corresponds to the updip limit of the SZ. The outer arc ridges off Sumatra are, in comparison with the forearc structures off Java and the Lesser Sunda islands, wider and partly elevated above sea level forming the Mentawai forearc islands. The downdip limit of the SZ coincides with the intersection of a deeper upper plate mantle with the subduction thrust fault beneath the forearc. Sunda Strait marks a transition zone between the Sumatra and Java margins. Seafloor morphology enables the identification of the seismogenic zone (SZ) across the entire Sunda margin. The SZ is uniformly wide for the Sumatra margin and narrows off Sunda Strait. Sunda Strait is the transition between the Sumatra margin and the uniformly narrow extent of the SZ of the Java/Lesser Sunda margin. Comparing the Java and Lesser Sunda islands with the Sumatra margin we find the differences along the Sunda margin, especially the wider extent of the SZ off Sumatra, producing larger earthquakes, to result from the combination of various causes: The sediment income on the oceanic incoming plate and the subduction direction; we attribute a major role to the continental/oceanic upper plate nature of Sumatra/Java influencing the composition and deformation style along the forearc and subduction fault. Off Sumatra the SZ is up to more than twice as wide as off Java/Lesser Sunda islands, enlarging the unstable regime off Sumatra and thus the risk of sudden stress release in a great earthquake. 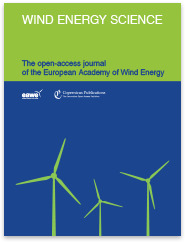 In: [Poster] In: EGU General Assembly 2011, 03.04.-08.04.2011, Vienna, Austria ; p. 12864 . Description: EGU2011-12864 The Woodlark Basin east of Papua New Guinea represents one of the few places on Earth where a spreading axis propagates into continental crust. This special tectonic setting allows insights into the evolution of magma composition as continental extension and break-up changes to the formation of ocean crust. We report here geochemical results on samples collected in 2009 from the four segments closest to the continental breakup, from segment 1 which abuts the detachment fault responsible for continental extension on Moresby Seamount in the West, to segment 4, representing mature oceanic crust in the East. A total of 208 glass samples have been analyzed for their major (EMPA) and trace element (LA-ICPMS) compositions. The data show strong E-W variations. Samples ranging from tholeiitic basalt and basaltic andesite to andesite and rhyolite are found on Segment 1. They have generally high alkali values and a wide range of trace element contents and ratios. Segments 2 to 4 magmas in contrast only comprise tholeiitic basalt with lower alkali contents and a more restricted range of trace element chemistry. The geochemical differences between the segments cannot be attributed to differentiation processes alone, and different sources are required. High Ba/La, (La/Sm)N, Rb/Sr, and Th/La on Segment 1 suggest a derivation from an enriched mantle source, while low Nd/Pb and Nb/U suggest that some of the enrichment may also reflect the influence of continental crust during magma genesis. Whether this continental signature is present in the form of recycled material in the mantle or as rafted continental blocks in the axial region is at present unclear. In contrast to rocks from segment 1, trace element compositions of volcanic glasses from segments 2 to 4 show a stronger MORB signature, presumably reflecting more mature spreading in this part of the basin. The influence of continental material appears to be minimal, suggesting that uncontaminated asthenosphere quickly flows into the rift and/or that continental blocks are not retained in the axial region for long time periods following the rifting-spreading transition. Description: EGU2011-1847-3 Lake Van is a lake by volume of 607 km3 and a maximum depth of 450 meters in a tectonically active zone in eastern Anatolia, Turkey. In summer 2010, Lake Van was the target of a deep drilling campaign (PaleoVan) in the frame of ICDP (International Continental Scientific Drilling Program). Two sites were drilled based on reflection seismic data collected during a seismic campaign in 2004. Here we present a first joint interpretation of the seismic and drilling data. Interpretation of seismic reflection data from lake reveals three physiographic provinces: a lacustrine shelf, a lacustrine slope, and a deep, relatively flat lake basin. The most prominent features of the lacustrine shelf and slope are prograding deltaic sequences, numerous unconformities, submerged channels, as well as closely spaced U- and/or V-shaped depressions, reflecting the variable lake level history of Lake Van. The seismic units of the shelf are dominantly composed of low-to-good continuity, variable amplitude reflections interpreted as fluvial deposits. The lake consists of three prominent basins (Tatvan, Deveboynu, and Northern Basins), separated by basement highs or ridges (Ahlat Ridge). The seismic units corresponding to these basins mainly consist of low to very high amplitude, well-stratified reflection patterns. Chaotic reflections are seen in parts of these basins. The Deveboynu Basin consists mainly of chaotic reflections. The Tatvan and Northern Basins are characterized by an alternating succession of well-stratified and chaotic reflecting layers. The chaotic seismic facies are interpreted as slump and slide deposits, which are probably the result of quick lake level fluctuations and/or earthquakes. The moderateto high amplitude, well-stratified facies seen in the deep parts of the basins away from the terrigenous sediment sources are interpreted as lacustrine deposits and tephra layers. The total sediment thickness in the deep parts of the lake is over 400 m. Prominent clinoforms indicate the initial flooding of Lake Van about 500 ka ago. The acoustic basement and the sediments lying on top of the basement in the southern part of the lake are disrupted by various intrusions and extrusions suggesting active volcanism. Synthetic seismograms calculated based on core logging, wire-line logging and check shot data will allow the correlation between seismic and drill data. This approach will allow extrapolating the stratigraphy from the wells to 3D-space by using the seismic data. In: [Talk] In: EGU General Assembly 2011, 03.04.-08.04.2011, Vienna, Austria ; p. 407 . Description: EGU2011-407 The spatial and temporal distribution of sea ice in the subpolar North Atlantic is mainly controlled by the advection of warm Atlantic Water via the Norwegian and West Spitsbergen Current in eastern Fram Strait. Simultaneously, polar water and sea ice from the Arctic Ocean is transported southward by the East Greenland Current. Hence, variations in the strength of this oceanic circulation regime may either stimulate or reduce the sea ice extent. Based on organic geochemical studies of a high-resolution sediment core from eastern Fram Strait we provide new evidence for the highly variable character of the sea ice conditions in this area. The combination of the sea ice proxy IP25 (Belt et al., 2007) with phytoplankton derived biomarkers (e.g. brassicasterol, dinosterol; Volkman 2006) enables a reliable reconstruction of sea surface and sea ice conditions, respectively (Müller et al., 2009; 2010). By means of these biomarkers, we trace gradually increasing sea ice occurrences from the Mid to the Late Holocene – consistent with the neoglacial cooling trend. Throughout the past ca. 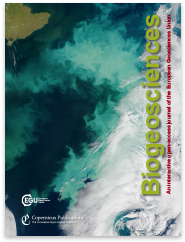 3,000 years (BP) we observe a significant short-term variability in the biomarker records, which points to rapid advances and retreats of the sea ice cover at the continental margin of West Spitsbergen. The co-occurrence of IP25 and phytoplankton markers, however, suggests that the primary productivity benefits from these sea ice surges. As such, higher amounts of open-water phytoplankton biomarkers together with peak abundances of IP25 indicate recurring periods of enhanced ice-edge phytoplankton blooms at the core site. To what extent a seesawing of temperate Atlantic Water may account for these sea ice fluctuations requires further investigation. Concurrent variations in Siberian river discharge (Stein et al., 2004) or Norwegian glacier extents (Nesje et al., 2001), however, strengthen that these fluctuations may be assigned to variations in the North Atlantic/Arctic Oscillation (NAO/AO) and (hence) a weakened/accelerated Atlantic Water input and Arctic sea ice export. Zhuravleva, Anastasia ; Bauch, Henning A. In: Climate of the Past Discussions . pp. 1-33. Description: Shallow-water sediments of the Bahama region containing the last interglacial (MIS 5e) are ideal to investigate the region&apos;s sensitivity to past climatic and sea level changes. Here we present new faunal, isotopic and XRF-sediment core data from the northern slope of the Little Bahama Bank. The results suggest that the bank top remained flooded across the last interglacial "plateau", ~ 129–117 ka, arguing for a relative sea level above −6 m for this time period. In addition, climatic variability, which today is closely coupled with movements of the intertropical convergence zone (ITCZ), is interpreted based on stable isotopes and foraminiferal assemblage records. During early MIS 5e, the mean annual ITCZ position moved northward in line with increased solar forcing and a recovered Atlantic Meridional Overturning Circulation (AMOC). The early MIS 5e warmth peak was intersected, however, by a millennial-scale cooling event, consistent with a southward shift in the mean annual ITCZ position. This tropical shift is ascribed to the transitional climatic regime of early MIS 5e, characterized by persistent high-latitude freshening and, thereby, unstable AMOC mode. Our records from the Bahama region demonstrate that not only was there a tight relation between local sedimentation regimes and last interglacial sea level history, via the atmospheric forcing we could further infer an intra-interglacial connectivity between the polar and subtropical latitudes that left its imprint also on the ocean circulation. Description: EGU2010-9841 Active mud volcanoes, where changing salinities of pore fluids, large temperature gradients and occurrences of free gas are frequently observed, should potentially exhibit significant variability in their internal resistivity structure. This is due to the fact that the bulk resistivity is mainly determined by the porosity of sediments and the electrical resistivity of the pore filling contained therein. The resistivity variations may be derived from controlled source electromagnetic (CSEM) measurements. CSEM systems consist of an electric dipole transmitter producing a time varying source field and electric dipole receivers, which measure the earth´s response to this signal. For a RWE Dea funded investigation of fluid and gas leakages at the North Alex Mud Volcano (NAMV) - a comparatively small target with an area of about 1km2 - we have developed a new high resolution CSEM system. The system consists of several autonomous electric dipole receivers and a lightweight electric dipole transmitter, which can be mounted on a small remotely operated underwater vehicle (ROV). The use of a ROV allows for a precise placement of the transmitter, which is a necessary prerequisite for the investigation of such a small target. Furthermore, electromagnetic signals may be transmitted from different directions with respect to the stationary receivers, allowing for a 3D-style tomographic experiment. In this experiment, ten receivers were deployed over the surface of NAMV at a total of 16 receiver locations. During three successful dives with a Cherokee ROV (Ghent University, Belgium), the transmitter was deployed at a total of 80 locations. Here we present first quantitative results consisting of apparent resistivity estimations from the CSEM time domain data for each transmitter-receiver pair. The apparent resistivity map shows that the NAMV indeed has a heterogeneous resistivity structure with apparent resistivities varying by at least a factor of two: low apparent resistivities (~ 0.8Ωm) are found towards the center of the MV, whereas higher apparent resistivities (~ 1.6Ωm) prevail away from the center. In a second step, we interpret the time-domain data based on 1D inversions. 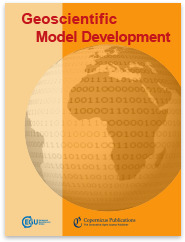 Good data fits can be achieved by models containing 2-3 layers. Generally, the models indicate low resistivities at the surface, which can be associated with penetrating salt water and/or high temperatures. Toward greater depths, increasing resistivities presumably are due to a combination of compaction of sediments (i.e. reduced pore space), an increased presence of fresh water and possible occurrences of free gas. For some 1D models, the increase in resistivity exceeds a factor of 10 or more and layer interfaces are indicated down to depths of up to 70m. The derived resistivity variations observed at the NAMV will be interpreted in conjunction with temperature (Feseker, this session), fluid flow (Brückmann et al., this session) and seismic data (Bialas et al., this session) acquired. Temperature variations measured in the upper few meters are related to fluid flow, where high temperatures are indicative of upwelling fluids of low salinity and low temperature of either a downward flow of saline fluids or no flow activity. This type of surface measurement constitutes an integrative fluid flow gauge, which we can resolve vertically with our resistivity models. Seismic data yield a background structure to our resistivity model. New analysis of seismic data shows that seismic activity may also be linked to fluid flow activity, which we aim to match with resistivity variations and oscillations, which were observed in the electric and magnetic fields (Lefeldt et al., this session). In: [Talk] In: EGU General Assembly 2011, 03.-08.04.2011, Vienna, Austria . Description: The upwelling area in the eastern equatorial Pacific off Peru is one of the most pronounced oxygen minimum zones (OMZs) of the modern ocean. Modeling scenarios predict an expansion of the OMZs in the course of global change in the coming decades. As a consequence, the Peruvian continental margin represents a key locality for studies on biogeochemical dynamics in the future ocean. We present pore water and sediment data for redox-sensitive metals (Fe, Mn, V, Mo, and U) that have been collected along a transect across the Peruvian margin at 11°S. The results are used to evaluate the behavior of trace metals in a wide range of biogeochemical and hydrodynamic settings. In the core of the OMZ, where permanently anoxic conditions prevail, redox sensitive metals exhibit diagenetic behaviors largely consistent with previous studies. Vanadium and Mo are released from Fe oxihydroxides and subsequently recycled through diffusion across the benthic boundary or trapped through formation of authigenic V phases and sequestration of Mo by authigenic pyrite. Some U is delivered through diffusion across the benthic boundary, reduction and precipitation of UO2 and incorporation into phosphorites. 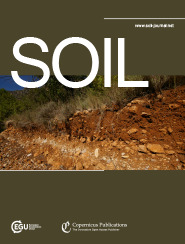 The utmost part of the buried U, however, is delivered in particulate form, most likely as bioauthigenic U which cannot be recycled in the suboxic waters overlying the anoxic sediments. In contrast to sediments in the core of the OMZ, sediments on the shelf experience frequent oxygenation episodes related to the passage of internal waves and the regular recurrence of El Niño events. These oxygenation episodes lead to the re-oxidation and remobilization of authigenic U and V. In contrast to that, the authigenic accumulation of Mo is favored by the occasional occurrence of slightly oxidizing conditions. This is most likely due to enhanced formation of sulfur intermediates necessary for pyrite formation and the increased stability of pyrite, the major Mo sink, under oxidizing conditions, compared to authigenic V and U phases. Redox oscillations in the Peruvian OMZ thus lead to a discrimination of U against Mo, a mechanism that should be considered in the interpretation of U/Mo systematics in paleo redox studies. Overall our results provide valuable constraints on how trace metal inventories of marginal sediments may respond to expanding shelf anoxia and to short term perturbations of sediment redox conditions. Werner, Kirstin ; Spielhagen, Robert F.
In: [Poster] In: EGU General Assembly 2011, 03.04.-08.04.2011, Vienna, Austria ; p. 2455 . Description: EGU2011-2455 The current interglacial has gone through a variety of warmer and colder periods. Consistent with the decreasing solar insolation during the Holocene, warmest conditions have occurred particularly within its earliest phase. We studied high-resolution sediment sequences from the Western Svalbard margin covering the last ca 10,000 years in order to reconstruct the variations of Atlantic Water advection to the Arctic, the sea ice extent, and the structure of the water column on the Westspitsbergen continental margin. The Fram Strait, often referred to as the Arctic Gateway, is the only deep-water passage for Atlantic-derived water masses to enter the Arctic Ocean. Northward advection of relatively warm and saline Atlantic Water masses keeps the eastern part of the Fram Strait ice-free all year. It therefore plays a crucial role for the heat budget of the Arctic. A multiproxy data set including geochemical, micropaleontological, and sedimentological parameters was established with centennial to multidecadal time resolution. 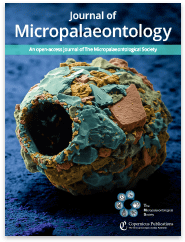 Records of foraminiferal oxygen and carbon isotopes, planktic foraminifer assemblages, and the amount of ice rafted debris clearly reveal distinct variations between climatically warmer and colder intervals throughout this period. Planktic foraminifer assemblages reveal warmest conditions for the early Holocene period (ca 10-8 ka). A second warming pulse is detected between 5 and 6 ka. In the second half of the Holocene, increased IRD contents are indicative of a significant cooling trend. Despite of the decreasing solar insolation planktic foraminiferal assemblages suggest a return of slightly strengthened Atlantic Water advection around 3 to 2 ka and a strong warming event in the present, anthropogenically influenced period. In: [Talk] In: EGU General Assembly 2011, 03.04.-08.04.2011, Vienna, Austria ; p. 8738 . Description: EGU2011-8738 At present, the Arctic is responding faster to global warming than most other areas on earth, as indicated by rising air temperatures, melting glaciers and ice sheets and a decline of the sea ice cover. As part of the meridional overturning circulation which connects all ocean basins and influences global climate, northward flowing Atlantic Water is the major means of heat and salt advection towards the Arctic where it strongly affects the sea ice distribution. Records of its natural variability are critical for the understanding of feedback mechanisms and the future of the Arctic climate system, but continuous historical records reach back only ca. 150 years. To reconstruct the history of temperature variations in the Fram Strait Branch of the Atlantic Current we analyzed a marine sediment core from the western Svalbard margin. 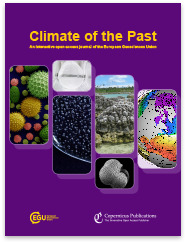 In multidecadal resolution the Atlantic Water temperature record derived from planktic foraminifer associations and Mg/Ca measurements shows variations corresponding to the well-known climatic periods of the last millennium (Medieval Climate Anomaly, Little Ice Age, Modern/Industrial Period). We find that prior to the beginning of atmospheric CO2 rise at ca. 1850 A.D. average summer temperatures in the uppermost Atlantic Water entering the Arctic Ocean were in the range of 3-4.5°C. Within the 20th century, however, temperatures rose by ca. 2°C and eventually reached the modern level of ca. 6°C. Such values are unprecedented in the 1000 years before and are presumably linked to the Arctic Amplification of global warming. Taking into account the ongoing rise of global temperatures, further warming of inflowing Atlantic Water is expected to have a profound influence on sea ice and air temperatures in the Arctic. Description: Dynamical processes during the formation phase of the Arctic stratospheric vortex in autumn (from September to December) can introduce considerable interannual variability in the amount of ozone that is incorporated into the vortex. Chemistry in autumn tends to remove part of this variability because ozone relaxes towards equilibrium. As a quantitative measure of how important dynamical variability during vortex formation is for the winter ozone abundances above the Arctic we analyze which fraction of an ozone anomaly induced during vortex formation persists until early winter (3 January). The work is based on the Lagrangian Chemistry Transport Model ATLAS. In a case study, model runs for the winter 1999–2000 are used to assess the fate of an ozone anomaly artificially introduced during the vortex formation phase on 16 September. The runs provide information about the persistence of the induced ozone anomaly as a function of time, potential temperature and latitude. The induced ozone anomaly survives longer inside the polar vortex compared to outside the vortex. Half of the initial perturbation survives until 3 January at 540 K inside the polar vortex, with a rapid fall off towards higher levels, mainly due to NOx induced chemistry. Above 750 K the signal falls to values below 0.5%. Hence, dynamically induced ozone variability from the early vortex formation phase cannot significantly contribute to early winter variability above 750 K. At lower levels increasingly larger fractions of the initial perturbation survive, reaching 90% at 450 K. In this vertical range dynamical processes during the vortex formation phase are crucial for the ozone abundance in early winter. Description: Permafrost is one of the essential climate variables addressed by the Global Terrestrial Observing System (GCOS). Remote sensing data provide area-wide monitoring of e.g. surface temperatures or soil surface status (frozen or thawed state) in the Arctic and Subarctic, where ground data collection is difficult and restricted to local measurements at few monitoring sites. The task of the ESA Data User Element (DUE) Permafrost project is to build-up an Earth observation service for northern high-latitudinal permafrost applications with extensive involvement of the international permafrost research community (www.ipf.tuwien.ac.at/permafrost). The satellite-derived DUE Permafrost products are Land Surface Temperature, Surface Soil Moisture, Surface Frozen and Thawed State, Digital Elevation Model (locally as remote sensing product and circumpolar as non-remote sensing product) and Subsidence, and Land Cover. Land Surface Temperature, Surface Soil Moisture, and Surface Frozen and Thawed State will be provided for the circumpolar permafrost area north of 55° N with 25 km spatial resolution. In addition, regional products with higher spatial resolution were developed for five case study regions in different permafrost zones of the tundra and taiga (Laptev Sea [RU], Central Yakutia [RU], Western Siberia [RU], Alaska N-S transect, [US] Mackenzie River and Valley [CA]). 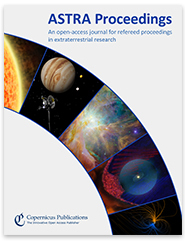 This study shows the evaluation of two DUE Permafrost regional products, Land Surface Temperature and Surface Frozen and Thawed State, using freely available ground truth data from the Global Terrestrial Network of Permafrost (GTN-P) and monitoring data from the Russian-German Samoylov research station in the Lena River Delta (Central Siberia, RU). The GTN-P permafrost monitoring sites with their position in different permafrost zones are highly qualified for the validation of DUE Permafrost remote sensing products. Air and surface temperatures with high-temporal resolution from eleven GTN-P sites in Alaska and four sites in Siberia were used to match up LST products. Daily average GTN-P borehole- and air temperature data for three Alaskan and six Western Siberian sites were used to evaluate surface frozen and thawed. First results are promising and demonstrate the great benefit of freely available ground truth databases for remote sensing products. 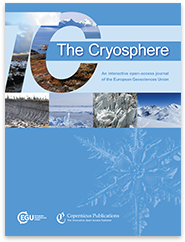 Description: We present first results from a coupled model setup, consisting of the state-of-the-art ice sheet model RIMBAY (Revised Ice Model Based on frAnk pattYn), and the community earth system model COSMOS. We show that special care has to be provided in order to ensure physical distributions of the forcings as well as numeric stability of the involved models. We demonstrate that a suitable statistical downscaling is crucial for ice sheet stability, especially for southern Greenland where surface temperatures are close to the melting point. The downscaling of net snow accumulation is based on an empirical relationship between surface slope and rainfall. The simulated ice sheet does not show dramatic loss of ice volume for pre-industrial conditions and is comparable with present-day ice orography. A sensitivity study with high CO2 level is used to demonstrate the effects of dynamic ice sheets onto climate compared to the standard setup with prescribed ice sheets. Description: Sea urchins as broadcasting spawners, release their gametes into open water for fertilization, thus being particularly vulnerable to ocean acidification. In this study, we assessed the effects of different pH scenarios on fertilization success of Strongylocen- 5 trotus droebachiensis, collected at Spitsbergen, Arctic. We achieved acidification by bubbling CO2 into filtered seawater using partial pressures (pCO2) of 180, 380, 980, 1400 and 3000 μatm. Untreated filtered seawater was used as control. We recorded fertilization rates and diagnosed morphological aberrations after post-fertilization periods of 1 h and 3 h under different exposure conditions in experiments with and without 10 pre-incubation of the eggs prior to fertilization. In parallel, we conducted measurements of intracellular pH changes using BCECF/AM in unfertilized eggs exposed to a range of acidified seawater. We observed increasing rates of polyspermy in relation to higher seawater pCO2, which might be due to failures in the formation of the fertilization envelope. In addition, our experiments showed anomalies in fertilized eggs: incomplete 15 lifting-off of the fertilization envelope and blebs of the hyaline layer. Other drastic malformations consisted of constriction, extrusion, vacuolization or degeneration (observed as a gradient from the cortex to the central region of the cell) of the egg cytoplasm, and irregular cell divisions until 2- to 4-cell stages. The intracellular pH (pHi) decreased significantly from 1400 μatm on. All results indicate a decreasing fertilization success 20 at CO2 concentrations from 1400 μatm upwards. Exposure time to low pH might be a threatening factor for the cellular buffer capacity, viability, and development after fertilization. Huntemann, Marcus ; Heygster, Georg ; Kaleschke, Lars ; [et al.] Krumpen, Thomas ; Mäkynen, M. ; Drusch, M.
Description: Sea ice thickness information is important for sea ice modelling and ship operations. Here a method to detect the thickness of sea ice up to 50 cm during the freeze-up season based on high incidence angle observations of the Soil Moisture and Ocean Salinity (SMOS) satellite working at 1.4 GHz is suggested. By comparison of thermodynamic ice growth data with SMOS brightness temperatures, a high correlation to intensity and an anticorrelation to the difference between vertically and horizontally polarised brightness temperatures at incidence angles between 40 and 50° are found and used to develop an empirical retrieval algorithm sensitive to thin sea ice up to 50 cm thickness. The algorithm shows high correlation with ice thickness data from airborne measurements and reasonable ice thickness patterns for the Arctic freeze-up period. Description: The Toba eruption that occurred some 74 ka ago in Sumatra, Indonesia, is among the largest volcanic events on Earth over the last 2 million years. Tephra from this eruption has been spread over vast areas in Asia, where it constitutes a major time marker close to the Marine Isotope Stage 4/5 boundary. As yet, no tephra associated with Toba has been identified in Greenland or Antarctic ice cores. Based on new accurate dating of Toba tephra and on accurately dated European stalagmites, the Toba event is known to occur between the onsets of Greenland interstadials (GI) 19 and 20. Furthermore, the existing linking of Greenland and Antarctic ice cores by gas records and by the bipolar seesaw hypothesis suggests that the Antarctic counterpart is situated between Antarctic Isotope Maxima (AIM) 19 and 20. In this work we suggest a direct synchronization of Greenland (NGRIP) and Antarctic (EDML) ice cores at the Toba eruption based on matching of a pattern of bipolar volcanic spikes. Annual layer counting between volcanic spikes in both cores allows for a unique match. We first demonstrate this bipolar matching technique at the already synchronized Laschamp geomagnetic excursion (41 ka BP) before we apply it to the suggested Toba interval. The Toba synchronization pattern covers some 2000 yr in GI-20 and AIM-19/20 and includes nine acidity peaks that are recognized in both ice cores. The suggested bipolar Toba synchronization has decadal precision. It thus allows a determination of the exact phasing of inter-hemispheric climate in a time interval of poorly constrained ice core records, and it allows for a discussion of the climatic impact of the Toba eruption in a global perspective. The bipolar linking gives no support for a long-term global cooling caused by the Toba eruption as Antarctica experiences a major warming shortly after the event. Furthermore, our bipolar match provides a way to place palaeo-environmental records other than ice cores into a precise climatic context. Description: The ongoing disintegration of large ice shelf parts in Antarctica raise the need for a better understanding of the physical processes that trigger critical crack growth in ice shelves. Finite elements in combination with configurational forces facilitate the analysis of single surface fractures in ice under various boundary conditions and material parameters. The principles of linear elastic fracture mechanics are applied to show the strong influence of different depth dependent functions for the density and the Young’s modulus on the stress intensity factor KI at the crack tip. Ice, for this purpose, is treated as an elastically compressible solid and the conse- quences of this choice in comparison to the predominant in- compressible approaches are discussed. The computed stress intensity factors KI for dry and water filled cracks are com- pared to critical values KIc from measurements that can be found in literature. Berkelhammer, M. ; Sinha, A. ; Mudelsee, Manfred ; [et al.] Cheng, H. ; Yoshimura, K ; Biswas, J. Description: There are a number of clear examples in the instrumental period where positive El Niño events were coincident with a severely weakened summer monsoon over India (ISM). ENSO&apos;s influence on the Indian Monsoon has therefore remained the centerpiece of various predictive schemes of ISM rainfall for over a century. The teleconnection between the monsoon and ENSO has undergone a protracted weakening since the late 1980&apos;s suggesting the strength of ENSO&apos;s influence on the monsoon may vary considerably on multidecadal timescales. The recent weakening has specifically prompted questions as to whether this shift represents a natural mode of climate variability or a fundamental change in ENSO and/or ISM dynamics due to anthropogenic warming. The brevity of empirical observations and large systematic errors in the representation of these two systems in state-of-the-art general circulation models hamper efforts to reliably assess the low frequency nature of this dynamical coupling under varying climate forcings. Here we place the 20th century ENSO-Monsoon relationship in a millennial context by assessing the phase angle between the two systems across the time spectrum using a continuous tree-ring ENSO reconstruction from North America and a speleothem oxygen isotope (δ18O) based reconstruction of the ISM. The results suggest that in the high-frequency domain (≤ 15 yr), El Niño (La Niña) events persistently lead to a weakened (strengthened) monsoon consistent with the observed relationship between the two systems during the instrumental period. However, in the low frequency domain (≥ 60 yr), periods of strong monsoon are, in general, coincident with periods of enhanced ENSO variance. This relationship is opposite to which would be predicted dynamically and leads us to conclude that ENSO is not pacing the prominent multidecadal variability that has characterized the ISM over the last millennium. Kurahashi-Nakamura, T. ; Losch, M. ; Paul, A. Description: In a feasibility study, the potential of proxy data for the temperature and salinity during the Last Glacial Maximum (LGM, about 19 000 to 23 000 years before present) in constraining the strength of the Atlantic meridional overturning circulation (AMOC) with a general ocean circulation model was explored. The proxy data were simulated by drawing data from four different model simulations at the ocean sediment core locations of the Multiproxy Approach for the Reconstruction of the Glacial Ocean surface (MARGO) project, and perturbing these data with realistic noise estimates. 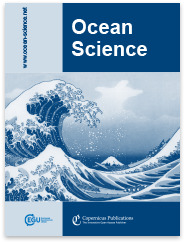 The results suggest that our method has the potential to provide estimates of the past strength of the AMOC even from sparse data, but in general, paleo-sea-surface temperature data without additional prior knowledge about the ocean state during the LGM is not adequate to constrain the model. On the one hand, additional data in the deep-ocean and salinity data are shown to be highly important in estimating the LGM circulation. On the other hand, increasing the amount of surface data alone does not appear to be enough for better estimates. Finally, better initial guesses to start the state estimation procedure would greatly improve the performance of the method. Indeed, with a sufficiently good first guess, just the sea-surface temperature data from the MARGO project promise to be sufficient for reliable estimates of the strength of the AMOC. Bracher, Astrid ; Taylor, Marc H. ; Taylor, Bettina ; [et al.] Dinter, Tilman ; Röttgers, R. ; Steinmetz, F.
Description: The composition and abundance of algal pigments provide information on characteristics of a phytoplankton community in respect to its photoacclimation, overall biomass, and taxonomic composition. Particularly, these pigments play a major role in photoprotection and in the light-driven part of photosynthesis. Most phytoplankton pigments can be measured by High Performance Liquid Chromatography (HPLC) techniques to filtered water samples. This method, like others when water samples have to be analysed in the laboratory, is time consuming and therefore only a limited number of data points can be obtained. In order to receive information on phytoplankton pigment composition with a higher temporal and spatial resolution, we have developed a method to assess pigment concentrations from continuous optical measurements. The method applies an Empirical Orthogonal Function (EOF) analysis to remote sensing reflectance data derived from ship-based hyper-spectral underwater radiometric and from multispectral satellite data (using the MERIS Polymer product developed by Steinmetz et al., 2011) measured in the Eastern Tropical Atlantic. Subsequently we developed statistically linear models with measured (collocated) pigment concentrations as the response variable and EOF loadings as predictor variables. The model results, show that surface concentrations of a suite of pigments and pigment groups can be well predicted from the ship-based reflectance measurements, even when only a multi-spectral resolution is chosen (i.e. eight bands similar to those used by MERIS). Based on the MERIS reflectance data, concentrations of total and monovinyl chlorophyll a and the groups of photoprotective and photosynthetic carotenoids can be predicted with high quality. The fitted statistical model constructed on the satellite reflectance data as input was applied to one month of MERIS Polymer data to predict the concentration of those pigment groups for the whole Eastern Tropical Atlantic area. Bootstrapping explorations of cross-validation error indicate that the method can produce reliable predictions with relatively small data sets (e.g., < 50 collocated values of reflectance and pigment concentration). The method allows for the derivation of time series from continuous reflectance data of various pigment groups at various regions, which can be used to study variability and change of phytoplankton composition and photo-physiology.